Home > Departments > Faculty > Joseph de Rivera Ph.D.
Dr. de Rivera received a B.A. from Yale University in 1953 and a Ph.D. from Stanford University in 1961. 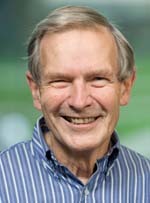 He has been at Clark since 1970, and formerly directed the concentration in Peace Studies. Dr. de Rivera is interested in emotional experience and when our feelings and narratives lead us to care for others and act on their behalf (rather than paralyze us or lead us to be destructive). He teaches social psychology and peace studies, and his research has focused on describing the structure and dynamics of emotion in individuals and collective life. What is the role of positive emotions such as joy? When does anger lead to political action? Can we predict emotional climates and influence a culture of peace? How can love rather than fear govern our imagination and determine our behavior? de Rivera, J. H. (2009). Building cultures of peace. New York: Springer. de Rivera, J. H. (2006). Conceptual Encounter: The Experience of Anger. In C.T Fischer (Ed. ), Qualitative research methods for psychologists (pp. 213-245). San Diego: Elsevier. de Rivera, J. H. (2004) Introduction: Assessing cultures of peace. Peace and Conflict, 10, 95-100.
de Rivera, J. H. (2004) Assessing the basis for a culture of peace in contemporary societies. Journal of Peace Research, 41, 531-548. Conjero, S., de Rivera, J. H., Páez, D., & Jiménez, A. (2004) Alteración afectiva personal, atmósfera emocional y clima emocional tras los atentados del 11 de marzo. Ansiedad y Estrés, 10(23), 299-312.
de Rivera, J. H. (2003) Aggression, violence, evil, and peace. In T. Miller & M.J. Lerner (Eds.) Comprehensive Handbook of Psychology, Vol. 5: Personality and Social Psychology (pp. 569-598).